Catherine Mumford was born in Ashbourne, Derbyshire, on 17 January 1829. From an early age she was a serious and sensitive girl. She had a strong Christian upbringing and by the age of 12 had read her Bible through eight times! But it was not until she was 16, after much struggling, that she was really converted. In her hymn book she read the words, 'My God I am Thine, what a comfort Divine', and realised the truth of this statement for herself. At 14 she was seriously ill and spent a great deal of time in bed. But she kept herself busy, and was especially concerned about the problems of alcohol. She wrote articles for a magazine, which encouraged people not to drink. She met William when he came to preach at her church. They soon fell in love and became engaged. During three years of engagement, Catherine was a constant support to William in his tiring work of preaching, through her letters. At last on 16 June 1855, they were married. Unlike most weddings, theirs was very simple with no great expense. They wanted to use all their time and money for God. Even on their honeymoon, William found himself asked to speak at meetings. Together they accepted this challenge of being used by God before even thinking of themselves. At Brighouse, Catherine first began to help in the work of the church. She was extremely nervous, but found the courage to speak in children's meetings. She enjoyed working with young people. However it was unheard of for women to speak in adult meetings. Catherine was convinced that women had an equal right to speak. At Gateshead, when the opportunity was given for public testimony, she went forward to speak! It was the beginning of a tremendous ministry, for people were greatly challenged by her preaching. Catherine found the courage to speak to people in their homes, and especially to alcoholics whom she helped to make a new start in life. Often she held cottage meetings for converts. She was also a mother with a growing family of eight children and was dedicated to giving them a firm Christian knowledge. Two of them became Generals of The Salvation Army. In 1865 when the work of The Christian Mission began William preached to the poor and ragged, and Catherine spoke to the wealthy, gaining support for their financially demanding work. In time she began to hold her own campaigns. When William Booth became known as the General, Catherine was known as the 'Army Mother'. 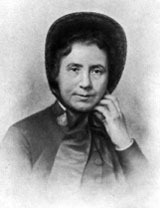 She was behind many of the changes in the new movement, designing a flag, bonnets for the ladies and contributing to the Army's ideas on many important issues and matters of belief. When she died in 1890 it was a great loss. Her life had been a challenge to thousands who remembered her as an untiring soldier in God's Army.